The USDA Crop Progress Report showed corn and spring wheat planting behind analyst expectations and 5-year average. Rain, snow, cold, and flooding have slowed down the planting progress. Investors aren't buying into the weather rally as other variables continue to tilt towards bearish sentiment. Grains futures across the board led by wheat down Tuesday morning. CBOT-KCBT wheat spread still bearish. Despite the United States Department of Agriculture's (USDA) Crop Progress Report on Monday revealing that weather is slowing down crop planting, other variables such as strong inventory, old crop supply and uncertainties surrounding trade talks continue to weigh down on the market. Monday afternoon, the USDA issued its weekly crop progress report. The report showed that as of April 14, only 3% of this year's corn has been planted. That matches last year's pace, but falls behind trader expectations and the 5-year average of 5%. It is the southern states that are leading the way so far, including Texas (57%), North Carolina (18%) and Tennessee (16%). Spring wheat planting also has been slowed by weather with only 2% of acres across the top six production states having reported. This is well behind the 5-year average of 13%. States leading the way so far are across the Pacific Northwest, including Idaho (18%) and Washington (17%). The U.S. May corn futures was seen down 0.24% to $3.6112 Tuesday morning. U.S. May soybean futures were down 0.24% to $8.9588, while U.S. wheat leads the way down 1.17% to 4.5362. For the less volatile, unleveraged Teucrium ETF grain products, the Teucrium Corn ETF (CORN) was seen down 0.46% ($0.07) to $15.42, the Teucrium Soybean Fund (SOYB) was down 0.56% ($0.09) to $16.03, and the Teucrium Wheat Fund (WEAT) was down 0.56% ($0.03) to $5.31. Figure 1 below is a price trend chart of the front-month May futures contract for wheat over the past 24 hours. 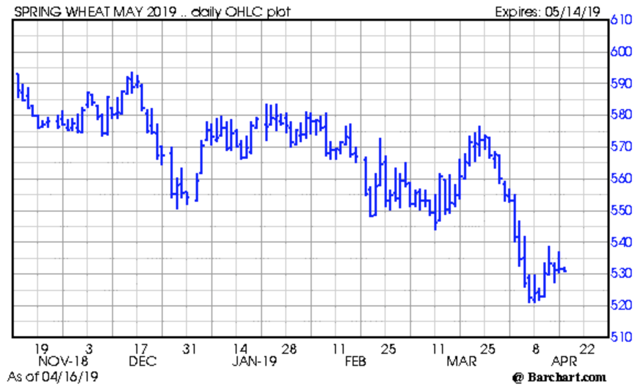 May Chicago Soft Red Winter Wheat (SRW) futures was seen down Tuesday morning by 6 cents to $4.534, with May Kansas City Hard Red Winter Wheat (HRW) futures down 5.2 cents to $4.282, resulting in a 25-cent premium of CBOT wheat to KCBT wheat. MGEX's Hard Red Spring Wheat (HRSW) May contract was down $0.06 to $5.310. Figure 2 below is a price trend chart of the front-month May futures contract for spring wheat. Winter wheat held steady from last week with 60% rated in good-to-excellent condition. Another 31% of the crop was rated fair, with the remaining 9% rated poor or very poor (all unchanged from last week). Here is the link to this week's USDA Crop Progress Report. 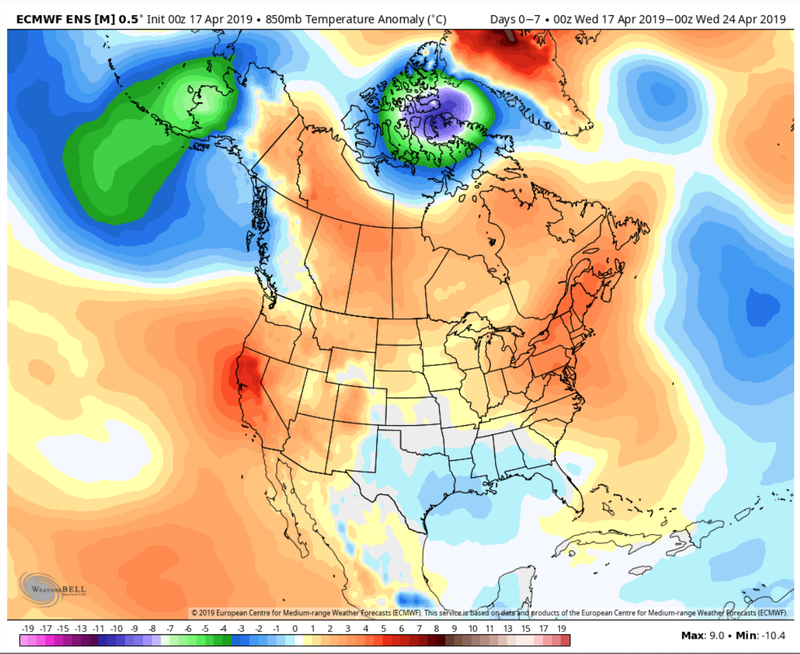 The slow planting progress, thanks to very wet, cold, and snowy conditions recently in the major production areas for corn and spring wheat are bullish signals. This past winter's weather was unfavorable to areas that produce these crops and now due to poor working conditions, farmers are having trouble planting. The good news is that weather conditions across these areas (spring wheat belt and western corn/soybean belt) will see weather conditions improve over the next week or so. Warmer and drier weather conditions will allow for farmers to get out into the fields and plant. Over the next week or so, we are expecting more dry days than wet ones so more open days than close days for farming. Figure 3 below is a map from the 0z ECMWF ensemble showing normal to warmer than normal temperatures over much of the country over the next 7 days. Figure 4 is a map showing the 7-day accumulated precipitation forecast across the Lower 48. 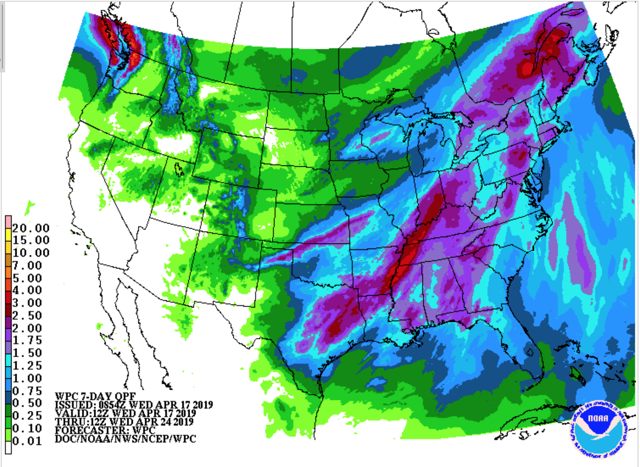 Much of the precipitation is expected to fall over the southern U.S. (Delta) and the eastern U.S., including the eastern corn belt. Winter wheat being in mostly good to excellent condition, coupled with large supply domestically and globally, is a bearish sign for the crop. The plus 20 cent CBOT wheat to KCBT wheat spread supports this. 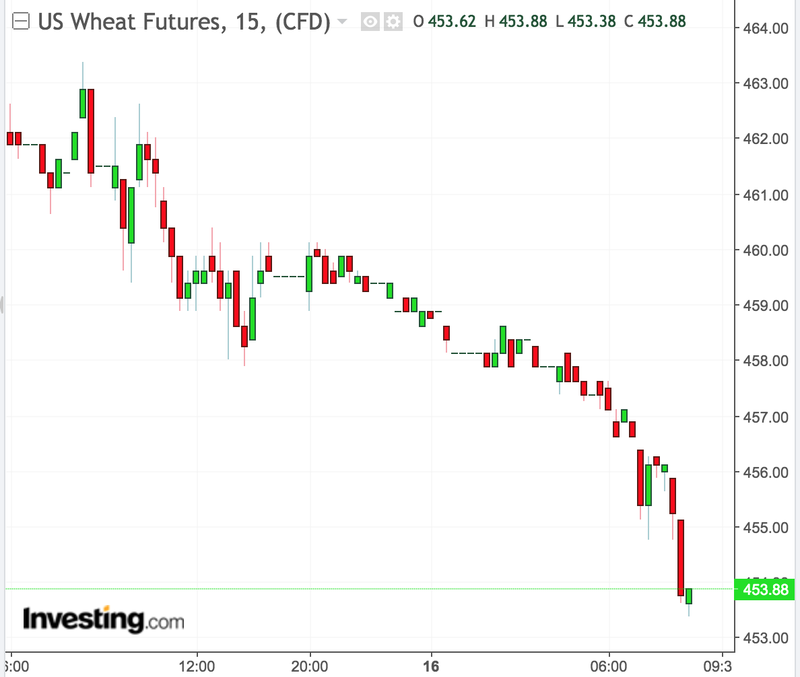 Despite, the mostly positive progress report, winter wheat's condition plus several other variables continue to point towards a bearish outlook in the grain space. Investors should continue to take a passive 'wait and see' approach with all of the bearishness surrounding the market. I wouldn't recommend any buying yet at this point.